Treat Yourself to this Japanese Delicacy if You Dare – Ovaries From a Poisonous Fish! You may think it’s crazy to voluntarily eat poisonous fish, but in the case of pufferfish, or “fugu” in Japanese, it’s something the Japanese have been doing for a long time. We understand how the idea of eating a potentially deadly poisonous fish could be off-putting to some, but most Japanese people wouldn’t think twice about going to a restaurant and having pufferfish; in fact most of us would welcome it as a treat, as a full-course fugu meal usually doesn’t come cheap. Well, this time, we have a story from one of the reporters at the Pouch website about an unusual way to have pufferfish, and this is definitely a recipe you won’t be able to recreate at home! Typically, thinly sliced sashimi or a hot pot (“fugu-nabe“) in which pieces of fugu are cooked in a pot of boiling water with a variety of vegetables, would be some of the standard ways to eat fugu in Japan. In this instance, however, the reporter had the opportunity to mail order a unique dish of fugu ovaries, and she shares her experience with us. Posted in 1, Arthurs Potting Shed, Food, Japan, They Said, WTF. Comments Off on Treat Yourself to this Japanese Delicacy if You Dare – Ovaries From a Poisonous Fish! Pepsi and Gundam Join Forces to Deliver New Drink That Will Not Only Quench Your Thirst but Entertain Your Eyes! We’ve previously reported to you on Gundam-themed products that you can wear (without looking geeky), or eat in the form of green tofu. And now, there’s going to be a Gundam product that you can drink! Fans of the popular Japanese anime will be delighted to hear that a new soda featuring Gundam images will be coming out in early August, and judging from the picture that has been released, the cans look awesome! Suntory Beverage & Food Limited recently announced that they will be selling a new line of Pepsi Cola Drinks in uniquely designed cans in collaboration with the Gundam-themed entertainment facility “Gundam Front Tokyo“. The “Pepsi Cola Design Cans“, as the new line of drinks are called, will be sold in eight different designs featuring machines or “mobile-suits” from the Gundam anime, specifically the Gundam, Gun Cannon, Gun Tank, Zaku (Mass-Production Type), Char’s Custom Made Zaku, Gouf and Dom mobile suits as well as the White Base. Each 350 ml (11.9 oz) can will be priced at 115 yen and will be sold throughout Japan starting August 7th but in limited quantities. The combination of cool Gundam artwork and the refreshing taste of Pepsi is bound to thrill even casual Gundam fans. These Pepsi design cans may sell very quickly once they appear on the market! Posted in 1, Art, Arthurs Potting Shed, Far East Asia, They Said, WTF. Comments Off on Pepsi and Gundam Join Forces to Deliver New Drink That Will Not Only Quench Your Thirst but Entertain Your Eyes! The hydrogen sulfide contained in flatus has the ability to help reduce blood pressure, according to a recent medical study, yet researchers at Zhongda Hospital at Southeast University in Nanjing are still unsure of the amount needed to be beneficial and whether patients are willing to accept “eating farts” as a form of treatment, reports our Chinese-language sister newspaper Want Daily. The smell of flatus comes from hydrogen sulfide, a substance that has been proven effective in controlling blood pressure in mice in an experiment at John Hopkins University. The study has been published in the journal Science. Despite the treatment’s potential, using gas to treat high blood pressure has yet to be tested on humans, said Yao Yuyu, an associate professor at Southeast University. The effective dosage could prove difficult to establish due to the difference in size between humans and mice. The gas could also have negative effects on other parts of the body, Yao said. The most noticeable feature of the Camatte is its “dress-up” ability. Just like a doll, the outer body can be completely changed depending on your mood. You can fairly easily slip on and off the different bodies each with completely different colors and shapes. Looking further inside, the car has a unique three seat triangle orientation. The driver’s seat and pedals are highly adjustable and combined with the car’s compact size can even accommodate small children. The arrangement of seats can easily allow parents to take over if their children lose control of the car at any time making it great for driving practice (off of public roads of course). You wouldn’t even have to worry about the kids putting dents into the car since you can simply replace the body in minutes. However, since this is just a concept car, we’ll never see it fully realized, especially since the prospect of 7 year-olds behind the wheel is terrifying no matter what kind of car it is. Still, having the dress-up feature introduced on regular models could be pretty sweet. Even having the ability of easily changing your car’s color alone would keep it fresh for longer and satisfy everyone in the family who has different tastes. Posted in 1, Art, Japan, They Said, WTF. Comments Off on Toyota Shows Off the Ultimate Family Car, Even the Kids Can Drive it! A US pensioner has been arrested for threatening to shoot a neighbour for breaking wind outside of his home. Daniel Collins Junior, 72, of Teaneck, New Jersey, is accused of pointing a silver revolver at his 47-year-old neighbour. Police say the confrontation came in the lobby of their apartment building after the neigbbour “farted” as he walked by Collins’ door. Collins told detectives he heard the un-neighbourly act from inside his apartment, reports the Bergen Record. The neighbour called police, who found a revolver under the front passenger seat of Collins’ vehicle. Collins was charged with aggravated assault, unlawful possession of a firearm, possession of a weapon for an unlawful purpose and terroristic threats. Posted in 1, Arthurs Potting Shed, They Said, WTF. Comments Off on A step too fart? It’s officially summertime, which means lots of opportunities to drink outdoors. 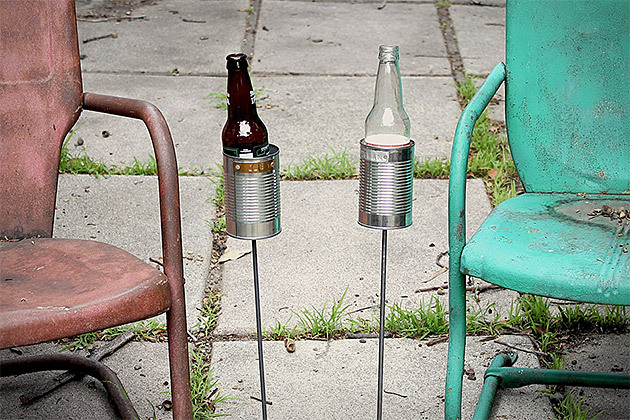 Keep your favorite libation nearby with these Hobo Tin Can Beer Holders. Basically tin cans on metal sticks, each measures 28-inches tall, features a crushed bottle cap on the bottom, and comes with a crudely hand-stamped name plaque for marking your territory beverage. The name of the restaurant is Fun Fun Shop and despite the signboard that reads “Chinese Cooking” they actually offer a range of dishes into Korean and Japanese as well. Having none of us ever eaten dog before, we sent our most iron-gutted reporters to see if the taste could possibly justify the unpleasant act of eating man’s best friend.